The Beach. It’s Florida’s greatest resource. With over 40 miles of coastline in St. Johns, there are rarely crowds at our beaches and the cost to use them is free or nearly free! From late March through November, my family makes it a priority to go to the beach. With four children who love swimming, surfing, castle-building and beach combing, being at the beach is the best retreat, perfect for creating family memories and moments etched in our minds forever. We are not alone. In our BEST OF ST. JOHNS SURVEY, the favorite family activity for locals (by far) is “going to the beach”! So whatever you seek, whether it’s fishing, swimming, surfing, sun-bathing, beach-combing, boogie boarding, wildlife viewing, or just gazing at those gorgeous waves, may you find it at the beach. Please enjoy our guide to the beaches of St. Johns! We prefer the area just south of the “official” beach access point, where we trek down the rocks and take in an incredibly expansive view. “Wow” is the word that best describes this beach that stretches out off the end of the southern tip of Anatasia Island, about a 10 minutes drive south of St. Augustine and just north of Marineland. It is a little windy but superior privacy, warm tidal pools, a jetty and rock formations make it an excellent adventure. One day last September while enjoying the beach my daughter found a baby sea turtle called a ‘washback’. We stayed with it without touching it until animal rescue came to help. That was a wonder to behold. There is also a great walking path, from the parking area that meanders down under the bridge along the intracoastal side and then hugs the coastline on the beach side. Facilities: Area offers vehicle access to the north only as of January 1, 2010, restrooms, off-beach parking, dune walkover, restrooms. Lifeguards are seasonal. This beach is great for days when you are feeling adventurous. With its miles of cochina formations that include little caves and crevices for kids to explore. It might be a bit much for younger children but my middle schoolers loved it. Yes, yes. We know. Its called ‘Mike-ler’. Located at the South end of Ponte Vedra Beach on Highway A1A, this is a full service beach with restrooms and lifeguard. The only drawback is during the season it can get quite crowded so it is best to get their early or later in the day if you want parking and a premium spot to set up your beach umbrella. This beach has beautiful coquina sand (a little hard on the feet) and is somewhat narrow but it is has a great energy and is always filled with lots of families and surfers seem to like too. On Anastasia Island 4 miles south of downtown St. Augustine on Highway A1A Beach Blvd in the City of St. Augustine Beach. Surfer’s say the 10th Street entrance has the best waves. The beach offers lots of wide-open space to really have privacy or hang with the crowd if that suits your fancy. ​Or, if you are looking for even more action, the area near the pier or at the slpash park is usually filled with families. This beach offers fishing, picnicking, a splash park, a pavilion that can be rented out for special events, restrooms, picnic tables, showers, and a visitor center are available. Lifeguards are staffed seasonally. If you do not feel like carrying all your beach stuff too far, this is one of our favorites because you simply drive your car up on the beach and unpack. 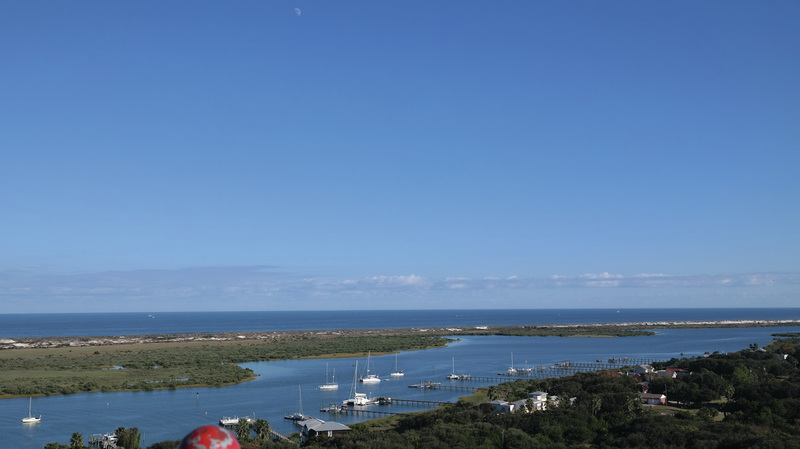 Look across the Matanzas inlet from Porpoise Point and you will see the beaufitul city of St. Augustine. Porpoise Point was named for the frequent porpoise sightings in the past but nowadays you may only see some dolphins. With full services, including dune walkover, covered picnic tables, and showers. This is a popular spot for fishing and launching jet skis. Pavilion may be reserved. Lifeguards staffed seasonally. On Anastasia Island, at St. Augustine Inlet, 1 mile east of downtown St. Augustine and directly north of St. Augustine Beach at 340-A A1A South, St. Augustine. 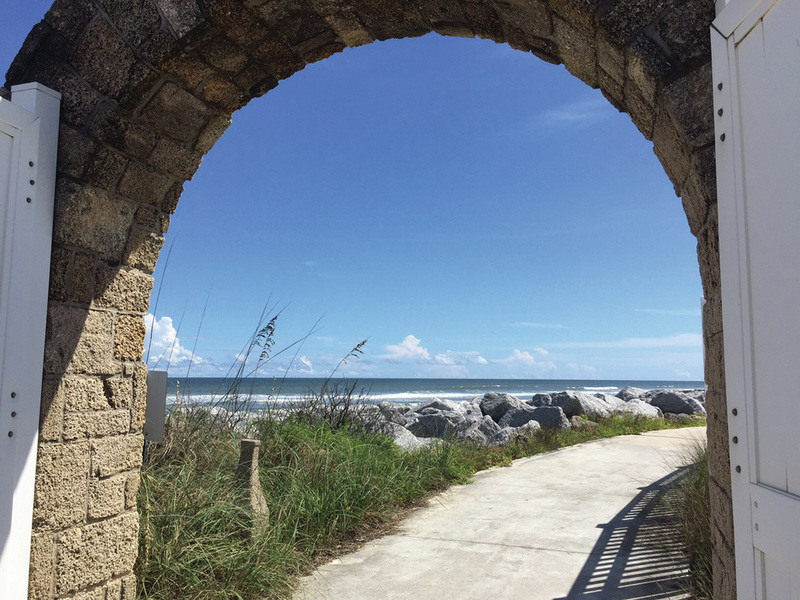 This park, beach and home of the St. Augustine Amphitheater provides a beautiful setting and is especially good for days when you want everything provided, from water sports, to food and beverages to life guard. Anastasia State Park is different because it is run by the state so your county beach pass just won’t do. A day pass is $8 per car. For more information, contact Anastasia State Park, (904) 461-2033. When you are finished at the beach make time to climb the stairs at the St. Augustine Lighthouse for a one-of-a-kind panorama of the nations oldest and most beautiful beach front and city!. Popularly known as Guana, this beach and reserve located between Ponte Vedra Beach and Vilano is perhaps the most pristine of any along our coast. Three access points allow visitors to park across the road and even on a sunny Saturday or Sunday, you’ll almost always find a space to park. The beach at the north lot has a large sandbar which is helpful if you have little ones but be advised, there is no lifeguard. And if you’re intersted in learning about wildlife and habitat uniuque to area, visit the GTM Environmental Education Center. It’s a great place to bring your kids or guests from out of town. (505 Guana River Road, Ponte Vedra Beach, FL 32082, (904) 823-4500.